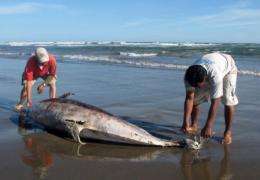 Experts measure a dead dolphin lying on a beach on the northern coast of Peru, close to Chiclayo, some 750 km north of Lima, in March 2012. Nearly 900 dolphins that washed up along Peru's northern coast since the start of the year died of natural causes, a top official said Tuesday, citing a government report that failed to convince environmental activists here. Nearly 900 dolphins that washed up along Peru's northern coast since the start of the year died of natural causes, a top official said Tuesday, citing a government report that failed to convince environmental activists here. "We have reached the conclusion that the deaths were from natural causes," said Gladys Trevino, Peru's Production Minister, speaking on local radio as she announced the results of a government investigation into the massive die-off. Trevino said that a study by the government-run Institute of Peru's Ocean (IMARPE) ruled out other causes for the deaths, and determined that massive die-offs occur periodically in the dolphin world. "It's not the first time that this has happened," she said, citing what she said were similar cases in New Zealand, Australia and other countries. "There's no reason to hunt for a reason why this would not be the cause," she said of the government's explanation. Trevino said that the government also had ruled out any effects of the oil production industry that is active in the area's waters, as well as infection by virus or bacteria. Peruvian officials earlier had hypothesized that the dolphins, along with some 5,000 dead sea birds -- mostly pelicans -- died due to the effects of rising temperatures in Pacific waters. Environment groups here remain unconvinced however, and said they were certain that the dolphin deaths were related to offshore oil exploration. One conservation group, the Scientific Organization for the Conservation of Aquatic Animals, known by its Spanish acronym ORCA, has blamed the dolphin deaths on oil exploration in the area, noise from which is proving detrimental to the well-being of the mammals, it said. A representative from ORCA said the group earlier this month tested 30 dead dolphins and found broken ears and damaged organs consistent with the victims suffering "the bends," also known as decompression sickness. "There's no reason to hunt for a reason why this would not be the cause."